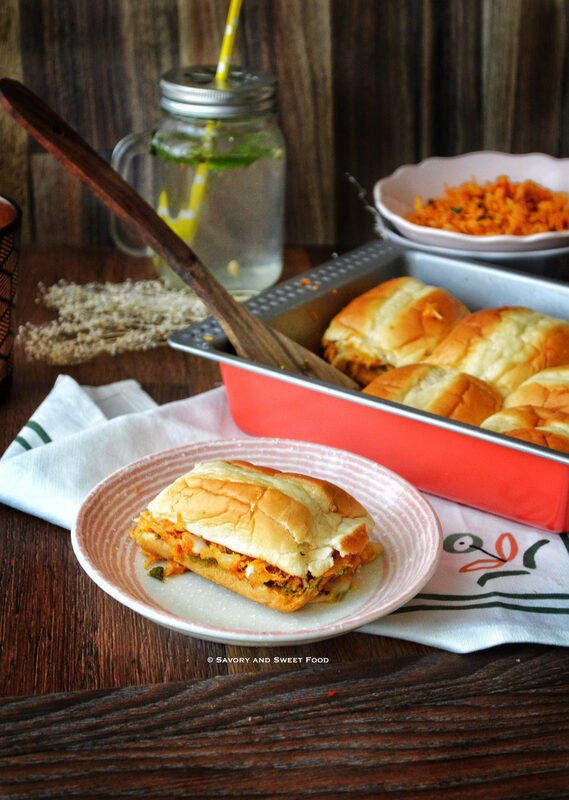 This pull apart cheesy chicken sliders make a perfect food for iftar or a party. 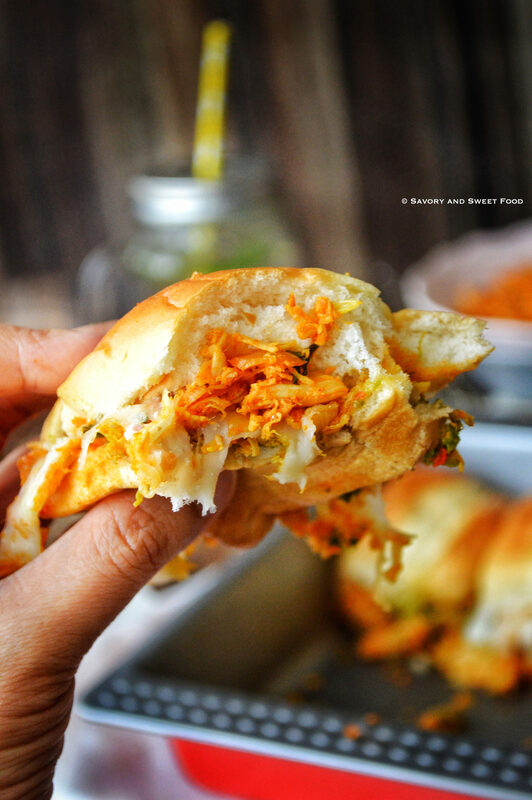 A spicy chicken filling along with a flavour filled coriander mint chutney and melted stringy mozzarella cheese packed inside soft buns, are too much fun to eat and so delicious. Ramadan calls for many recipes and unfortunately in most of our houses it includes deep fried foods. That really is a recipe for disaster. Everytime I think, I will make non-fried snacks for iftar, but sadly I end up making samosas, spring rolls etc which brings along loads of oil along with it. But today’s recipe is a non fried one. It is a little heavy because of the mozzarella cheese but you won’t feel that guilt like how you would feel after eating those fried goodies. 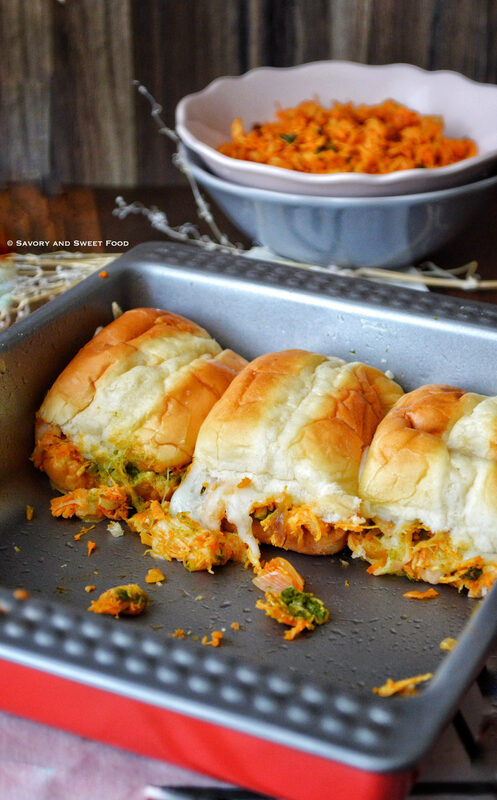 These sliders tastes superb too. What I love the most is that the assembling part is very easy. You don’t have to work separately with each bun. 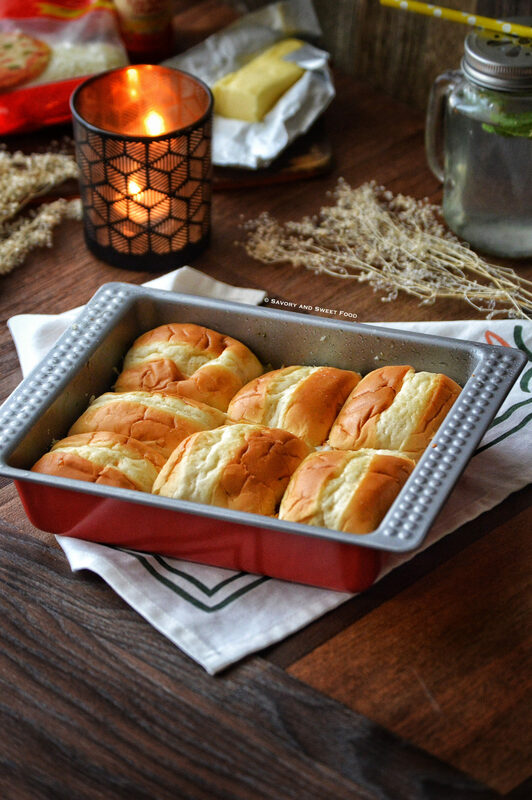 Instead just place the bottom part of the buns in a row in the baking tray, then spread out the chutney, chicken and mozzarella one on top of the other, cover with the other slice of bun and bake. Thats it. Super simple. 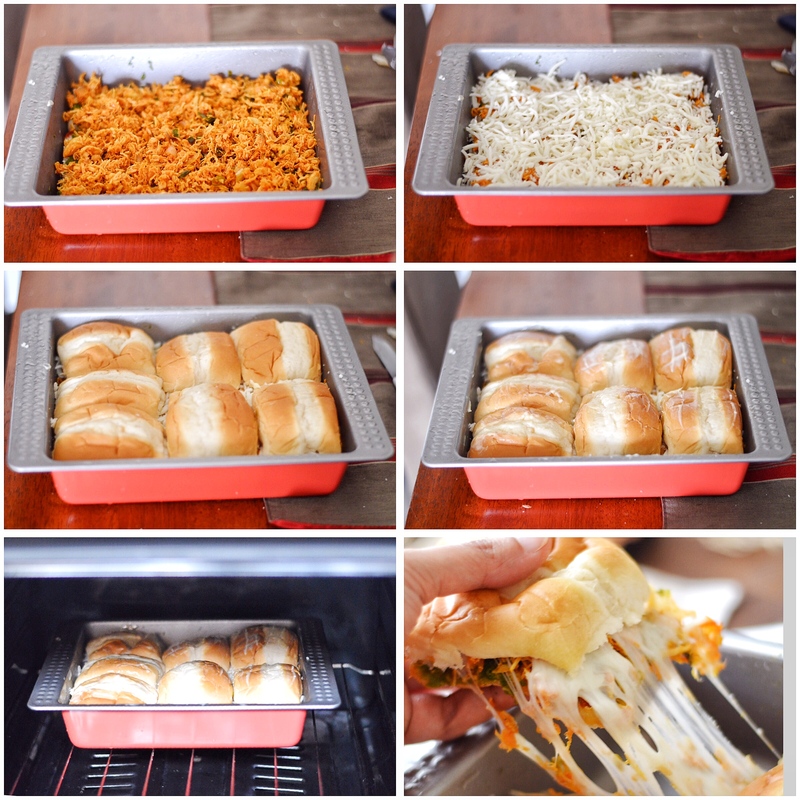 If the cheese is not melting evenly while baking, Just cover the baking tray with aluminium foil and bake further. Try to get real soft bun. Serve as soon as you take it out of the oven. To this add the spices and sauté for a minute. Add in the tomato paste and the sweet chilly sauce and sauté well. Shake in the salt. Add in water. Cook till water dries a little. Throw in the shredded chicken and mix well to combine. Finally top it with coriander leaves. Place all the ingredients in a blender and blend untill smooth. Cut open the bun from middle into two parts. 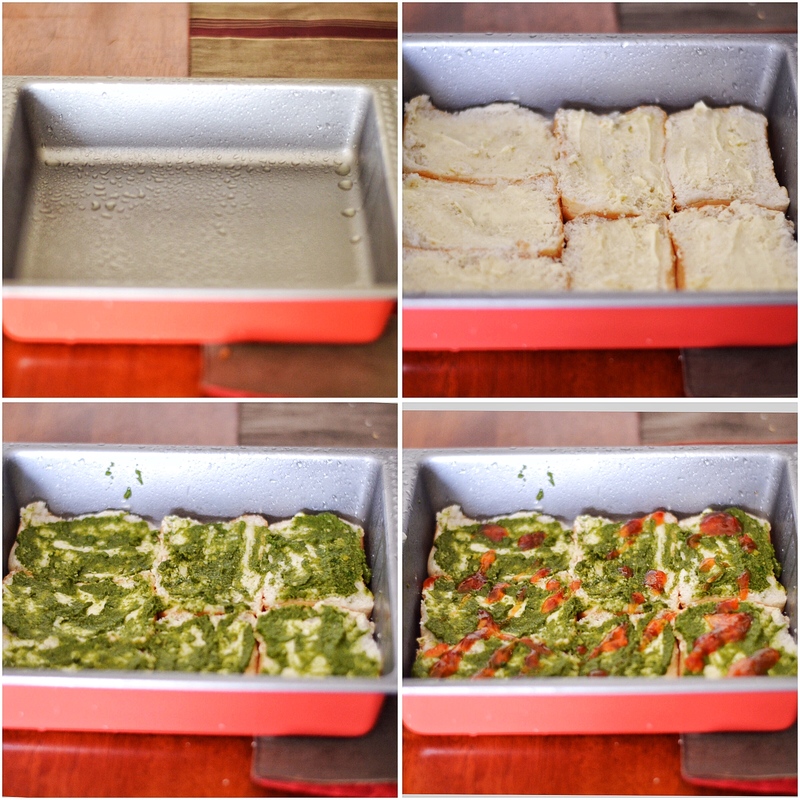 Place the bottom portion on a buttered baking tray. Spread butter on each slice of bun. Spread the green chutney on top of butter. Add sweet chilli sauce. Sprinkle generous amount of chicken filling on top of the chutney. Place a layer of mozzarella cheese. Cover with the top part of the bun. Spread butter over it. 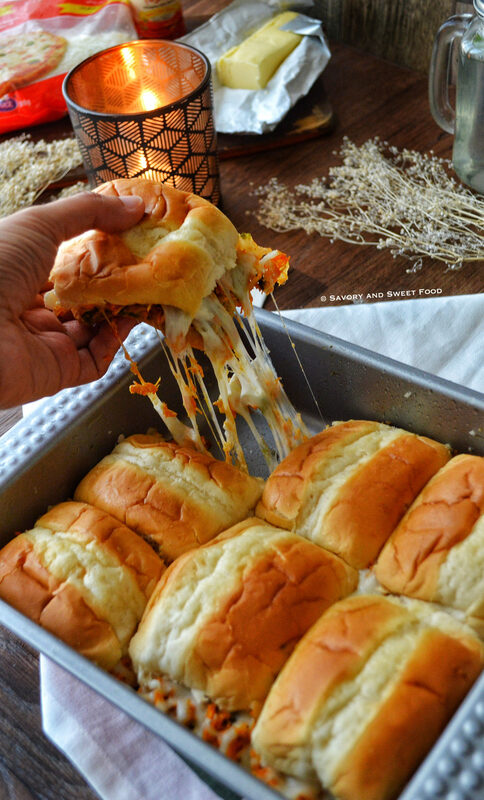 Bake for 10-15 minutes until the cheese melts. Serve immediately. 2. To this add the spices and sauté for a minute. 3. Add in the tomato paste and the sweet chilly sauce and sauté well. Shake in the salt. Pour in water and cook till it dries up a little. 4. Throw in the shredded chicken and mix well to combine. Finally top it with coriander leaves. Place a layer of mozzarella cheese. Cover with the top part of the bun. Spread some butter over it. Try to get real soft buns. 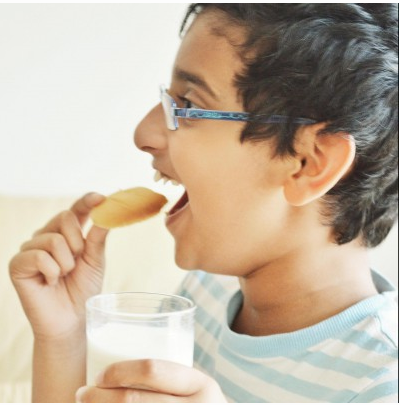 Woow that’s an awesome idea Sadia!looks scrumptious! Hi, from where did you get the buns? Hey! I got it from lulu hypermarket. Please do post something without cheese. Hey Aysha! Actually I am allergic to cheese and dairy products too. I know hard to believe What you can do is, just omit the cheese in this. It will taste good that way too. If only you are allergic omit the cheese on one side of the bun. For chicken parcels, cheese is highly optional. If not adding cheese.. Then should I bake it? Yeah bake it for a few minutes so that the buns get toasted a bit. And yeah other non dairy recipes are coming soon, in shaa Allah. Super hit!!! All thanx to u.
Wohooo! Thank you for making it Niks. Ooh that’s really nice. Thank you for writing back. Aslmk, ramadan Mubarak to u n ur family, yesterday I made this and we absolutely loved it.. Jazakallah khair for sharing the recipe. One qn the bun wer nice and soft yet wen i baked them the top got al a bit hard n crusty.. Not soft like the pics u shared.. May b because I applied butter on the tip aswell..
Walaikumsalaam Alina! Thank you so much for the feedback. Handsdown!!! 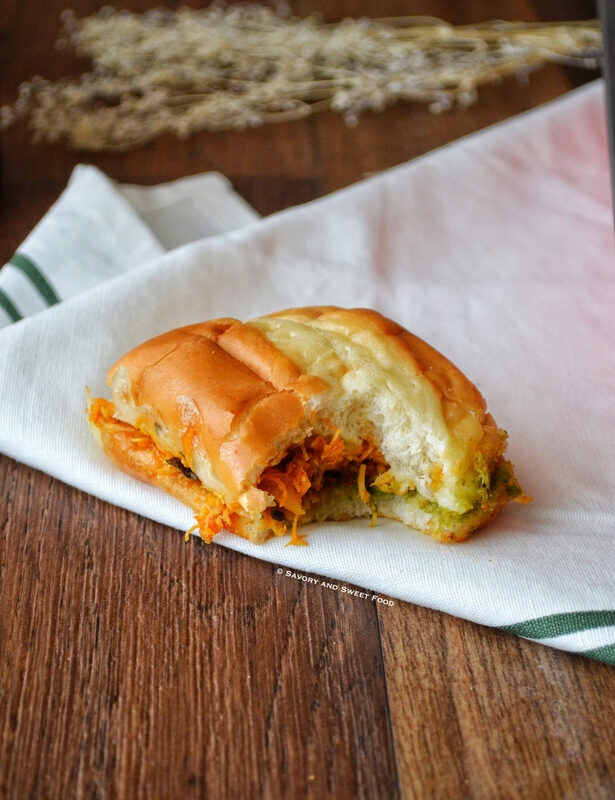 This is the best chicken slider I ever had. Oh thats great to know that you liked it so much. Yaay! So soo happy. Thank you for the feedback. Love to hear them. what temp should i bake this in ?? 300 degrees Celsius would be fine. The broiler should be on too.